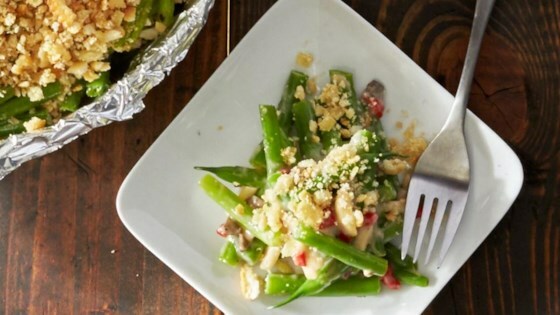 "Green bean casserole can get lighter with reduced fat, reduced sodium soup, a cracker onion topper, and some slivered almonds for crunch. Serving casseroles is a cinch when your dish is lined with Reynolds Wrap® Pan Lining Paper." Preheat oven to 350 degrees F. Line a 2-quart casserole with Reynolds Wrap(R) Pan Lining Paper. In a small saucepan cook onion in hot butter over medium heat until tender. Remove from heat. Stir in crushed crackers set aside. In a large bowl combine soup, almonds, roasted peppers, salt, and black pepper. Stir in green beans. Transfer mixture to prepared casserole. Sprinkle with cracker mixture. Bake, uncovered, for 30 to 35 minutes or until heated through. Serving casseroles is a cinch when your dish is lined with Reynolds Wrap Pan Lining Paper. Reynolds Wrap Pan Lining Paper combines the best of aluminum foil and parchment paper. The parchment paper side is nonstick so the food scoops out easily. The aluminum foil side makes it easy to mold to any shape or size casserole or baking pan or dish. Simply line your casserole with the parchment side towards the food, and cook as you normally would. Now, when you're finished baking, just toss the mess away.